In 1955, tiny Arco won fame as the world’s first nuclear-powered city. Today, it mainly serves as a jumping-off point for excursions into the nearby Craters of the Moon National Monument. 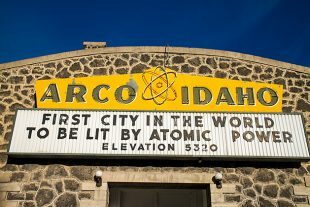 Arco is one of Idaho’s strangest little towns, although nearby Atomic City manages to be even stranger. And littler.